Flight Patterns is a data visualization project from designer Aaron Koblin that traces domestic airline traffic during a single 24-hour period over North America. Flight paths, using datasets provided by the Federal Aviation Administration (FAA) from 2005 and later from August 12, 2008, are rendered in color as arced trajectories. 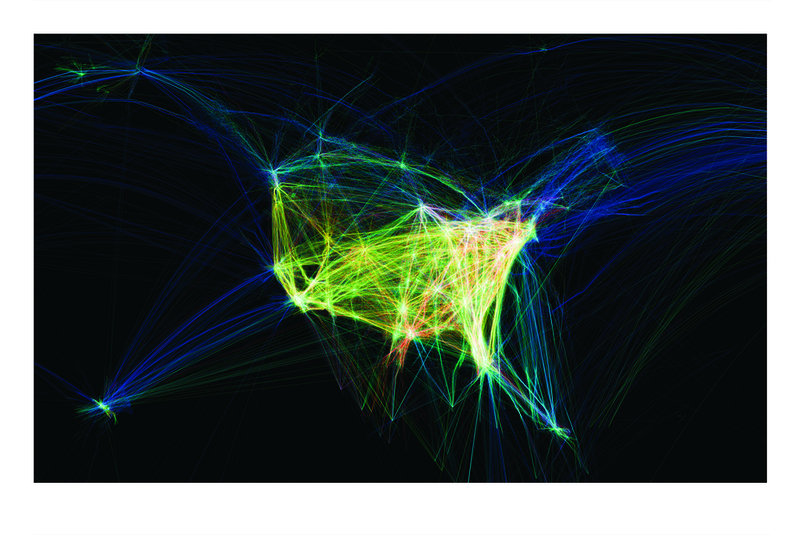 Koblin received flight locations every three minutes and interpolated those values to understand the path of each plane, plotting them with the Processing programming environment. He used Adobe After Effects and/or Maya to composite the frames in the final animated sequence. The result is a stunning visual animation in which the ebb and flow of flight patterns mimic waking life. Bursts of activity erupt as the East Coast awakens, following the sunrise across the rest of the country. Incoming flights from Europe descend upon the East Coast. Regional hubs become hotspots, clarified at a glance. The country is ablaze in midday air traffic. West Coast red-eyes begin their journey across an otherwise dark country. Flight Patterns recontextualizes raw flight data into a 56-second reflection on life and technology, tracing air traffic synapses, bursts, and connections to generate a cartographic portrait of North America. Koblin initially developed Flight Patterns as a series of experiments for Celestial Mechanics in 2005, a planetarium-based artwork installation by colleagues at UCLA, where he was completing his MFA in Design|Media Arts. Celestial Mechanics sought to visualize and dynamically present the aerial objects hovering, flying, and orbiting above our heads. Koblin briefly continued the Flight Pattern series when, in 2008, he created further flight studies, examining altitudes and aircraft types monitored by the FAA during a single 24-hour period. The work maintains its significance in the canon of data visualization: elegantly rendering air traffic data as cartography.